Week 17 - Crush at Nighthawks; June 10, 5:05 p.m.
What: The Crush visit Wichita Falls looking for a season sweep over the Nighthawks. This Season: April 21 - Crush 77, Nighthawks 73. Note: With a sweep of the Nighthawks, the Crush could seriously hamper Wichita Falls' playoff hopes. The Crush are 3-11 overall, 1-6 on the road and 1-2 in inter-conference play. Colorado is coming off a 29-51 home loss to the Sioux Falls Storm on June 3. They are averaging 38.1 points per game and are allowing 51.4 points per game. The Crush are fifth in the Intense Conference. The Nighthawks are 11-3 overall, 7-0 at home and 6-1 in inter-conference play. 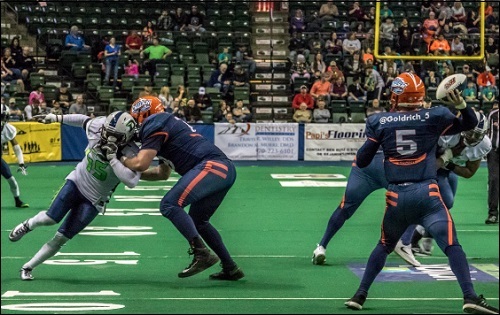 Wichita Falls is coming off a 44-37 road win over the Green Bay Blizzard on June 3. The Nighthawks are averaging 52.4 points per game and are allowing 45.3 points per game. The Nighthawks are third in the United Conference. Note: Roster information is subject to change and is presented here as a basic guide for following the game. Roster information is gathered from the IFL, the team's official websites, and other sources. Barring what seems like a miracle at this point, the Crush are likely playing the second-to-last game of their history. Project FANchise, the owner of this franchise, is moving on with its plans for a new football league to be comprised of a group of teams in the same location. The new league, which is and has been tested by the organization through the Salt Lake Screaming Eagles; the other team owned by FANchise. They have abandoned the league's contractual obligation to broadcast all IFL games to broadcast Screaming Eagles games on a gaming website called Twitch. It has been confirmed that the Salt Lake franchise will be folded at the end of this season. If a new owner is not found to take over the Crush, the same fate will fall to the Crush. There are still two games left to play. They will both be difficult. The Crush will have an opportunity to finish the season on a high note. The Nighthawks will be looking for revenge of their week 10 loss to the Crush in Colorado. This time around, the Crush will be on the road in the unfriendly confines of the Kay Yager Coliseum in Wichita Falls. Coming off a loss to the defending champion Sioux Falls Storm, Colorado will be playing two of this seasons three United Conference heavyweights in as many weeks. What looms the following week, in the season finale, at home against the Arizona Rattlers. Arizona has already clinched the Intense Conference title. Sean Goldrich will lead the Crush into battle. He is completing 54.3 percent of his passes and is averaging 100.4 passing yards per game (though he has played three games only partially). Kyle Kaiser is one of the best in the business, and will look to make his impact. Kaiser is second in the IFL in scoring with 130 points. The IFL's top scorer this season is the Nighthawks' Tyler Williams, who has 162 points. Lovie Rose, with 41 catches for 442 yards and six scores will look to take some pressure off of Kaiser. Anthony Jones Jr. also could make an impact in the receiving game. Josh Ford is the leading rusher, averaging just over 24 yards per game. Ford also can contribute to the receiving corps. Derrick Morgan, Cardelro Jones and Azziz Higgins are a talented group in the defensive backfield. Ace Clark, who leads the team in sacks, is adept at covering receivers and rushing the quarterback. Look for Phillip Lewis and Kwame Bell to try and put some pressure on Wichita Falls' quarterback Charles McCullum. Daniel Lindsey is a qualified return man who could make an impact in the kick return game. If the Crush are to complete the sweep over the Nighthawks, they will have to score, and score a lot. They also will have to find a way to contain Williams, who has 2,144 all-purpose yards this season. The Nighthawks are in a tight playoff race. heading into week seven, they are on the outside looking in. However, they have a realistic shot. If they can win out in their next final games, and if the Iowa Barnstormers can defeat the Sioux Falls Storm in week 18, Iowa and Wichita Falls will be the representatives in the playoffs from the United Conference. It would be the first time in seven seasons in which the Storm would not become IFL champions. The Nighthawks face the Crush in this game and the potentially playoff-bound Nebraska Danger in their final regular season game. Wichita Falls could be in a better situation in their playoff race had it not been for its 77-73 shootout loss to the Crush in week 10. It surely left a bad taste in the Nighthawks' collective mouth. Quarterback Charles McCullum, who leads the IFL in most major statistical passing categories, threw for 273 yards and eight touchdowns, but it was not good enough as Colorado scored on a 25 yard pass from Liam Nadler to Kyle Kaiser to secure the win. McCullum has completed two-third of his passes and has a better than four-to-one touchdown-to-interception ratio this season. Running back Tyler Williams is a one-man wrecking crew. He has 2,144 all-purpose yards and can break any play wide open. He is averaging 36.3 rushing yards per game and leads the IFL in scoring with 162 points. Jordan Jolly leads a strong receiving corps and is the only player in the league to surpass 1,000 receiving yards on the season. Demarius Washington, last year's IFL Offensive Player of the Year, is a big target who can go long or catch the ball underneath Troy Evans is a capable receiver to round out the starting group. Defensively, Michael Green and Michael Carter have combined for 12 interceptions, while Norris Wrenn III leads the team in pass breakups. Neiko Conway led the team last week with total tackles with 10, and has 43.5 total tackles on the season. Nmesa Okafor and Walter Thomas are the defensive linemen to keep an eye on. Williams has 1,298 kick return yards. He and Evans could each see time returning kicks in this one. By all accounts, the Nighthawks should come away with this win. They will need to rely on McCullum to play error-free (he threw two picks in the first meeting. The real key could be to simply unleash Williams on the Crush, who will have their hands full trying to stop -- or even slow -- him down. June 10 - Salt Lake Screaming Eagles (4-10) at Green Bay Blizzard (2-13), 5:05 p.m.
*indicates a conference game. All times are pacific. 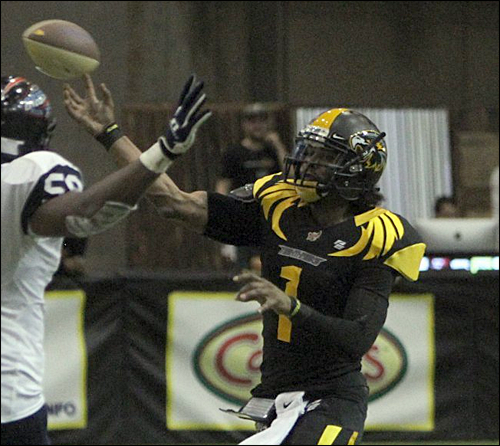 Tyler Williams became the first IFL player to accumulate over 2,000 all-purpose yards since 2009. He set the mark in the Nighthawks' 44-37 win over the Green Bay Blizzard last week. Williams has amassed 508 rushing yards, 338 receiving yards and 1,298 kick return yards. He has a total of 2,144 yards this season. Below, via the Nighthawks Twitter account, is a highlight of Williams from last week's game against the Blizzard. I really hope the Nighthawks make the playoffs as I think it would be great to see the Storm out of things. I also do have rooting interest for the Nighthawks, which being that the Crush are out of the playoff hunt kinda messes with my Crush fandom a bit which happened last time they met, but the Crush were in better position then. Regardless, I'm hoping for a great game as if we get close to the Upset Bowl (or Luck in Loveland) we are all in for a treat. It will be a tough task. We could be in for some competitive moments though. Nadler is a captain. Does that mean he is starting? No idea. I am watching the Salt Lake game and working both threads. This is a tricky night. Two games starting at the same time. Heidi and I are trying to follow both of them at the same time. Looks like Nadler is starting. He had a monster game against Wichita Falls earlier this season. FG Crush. Miles Bergner 41 yards. Touchdown Nighthawks. Tyler Williams 9 yard pass from Charles McCullum. Rockne Belmonte kick. This crowd in Wichita Falls is LOUD. Just like it should be in a game of this magnitude. What a run by Josh Ford! Touchdown Crush. Anthony Jones Jr. 8 yard pass from Liam Nadler. Miles Bergner kick. Full stats will be posted following the game.